Fleece Colorblock Hooded Sweatshirt. 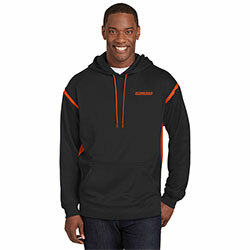 Snag-resistant and pill-resistant with a matte finish, this moisture-wicking hoodie owes its high performance to double-knit construction, while a full, athletic cut provides free range of motion. Features rib knit cuffs and front pouch pocket.